CenturyLink Internet: Fast Speeds, No Contract. With CenturyLink Internet, get the power of pure broadband internet and enjoy a dedicated connection. If CenturyLink is available in your area, you may qualify for speeds of up to 10, 20, 40, or 100 Mbps. Fiber Internet is available in select cities across the United States. If you’re looking for the fastest internet available, CenturyLink Fiber Internet is the choice for you. Fiber gigabit speed travels on a fiber network to bring you stunningly fast internet. Since fiber is the fastest CenturyLink plan, you’ll easily take care of activities that require a lot of bandwidth, like gaming or downloading new software at the same time on multiple devices. Want to minimize lag times and let everyone in your large household connect all their devices at once? The CenturyLink Internet with speeds up to 100 Mbps is one of CenturyLink's fastest Internet speed available, and it gives you the bandwidth you need to cut down on ping times, reduce latency, and share your speed with however many friends or family members come to visit. If you have three or four internet users at home with several devices each, the 80 Mbps plan is right for you. At high speeds up to 80 Mbps, you can stream and surf with ease, check social media any time, and binge-watch your favorite shows while your kids play basic games. CenturyLink Internet with speeds up to 80 Mbps is the most popular plan, and with CenturyLink, you get fast speeds, whole-home Wi-Fi, and online protection with @Ease basic security plan included in your internet subscription. If you prefer to stream and surf in higher resolution, 40 Mbps gives you the bandwidth to watch shows in HD while other household members browse, email, and check social media without slowdowns. Standalone internet is no contract; if your household’s size changes and you need a different plan, can easily cancel, increase, or decrease your internet speed without cancellation fees. For homes with one or two users with one or two devices each, CenturyLink Internet with speeds up to 20 Mbps offers speeds to browse, surf, and stream shows without paying for more than you need. Access tech support any time of day or night, 24/7/365. Pay the same rate for your internet speed plan free of contracts or price hikes. Protect your computer with @Ease, the CenturyLink customer care plan. Moving to a new neighborhood? Stay connected with CenturyLink Internet fiber-optics in your new home. Depending on your location, you may be able to enjoy fiber gigabit internet. Power your home and all your internet-enabled devices with the perfect connection for multiple high-bandwidth users. Give your family the ability to game more, stream more, download more, and do more online with a fiber connection from CenturyLink Internet. To learn more about CenturyLink Fiber, check out our Gigabit page. Customer speed experiences will vary, particularly when accessing the Internet wirelessly from various devices, and are not guaranteed. Maximum download/upload speeds are up to 940 megabits per second via a wired connection due to overhead capacity reserved to deliver the data. Listed Internet speeds vary due to conditions outside of network control, including customer location, equipment, and access through a wireless connection, and are not guaranteed. See centurylink.com/InternetPolicy for additional network performance information. What Is CenturyLink Internet Price for Life? Pay the same monthly fee with CenturyLink as long as you keep your Price for Life plan. Interested in internet plans with no contract? Sick of price hikes that increase your internet bill year after year? Switch to CenturyLink Internet. No matter which Price for Life plan you choose, your price won’t skyrocket unexpectedly. Instead, you’ll pay the exact same rate each month for as long as you keep your plan. Sound too good to be true? It’s not. From plans with speeds up to 20 Mbps or packages that let you access fiber gigabit speeds, your rate will stay the same the entire time you stay at your current address—no contract necessary. It’s easy to budget for your bill when you know exactly what you’ll pay each month. With Price for Life, look forward to consistent billing with no price hikes. With CenturyLink Internet, you pay as you go, month to month. Remember, that monthly rate stays the same while you enjoy your current plan at your current address. Standalone Internet or Bundle - your choice. Looking for quick, secure technical support? CenturyLink customer service has your back with expert advice 24/7. Visit the customer service page to find the right phone number for your particular issue. Whether you need assistance with installation, internet access, or ordering new services, CenturyLink customer service is available with the right answer and a helping hand whenever you need it. When you’re online, unseen hackers can lurk around every corner and behind every click. Fortunately, CenturyLink can help you protect your computer and avoid compromising your data or software. The CenturyLink @Ease Basic protection program included with your CenturyLink internet order brings you internet security through Norton antivirus technology, so you can browse safely. Want more protection against phishing or identity theft? Choose from one of the three other tiers of @Ease protection: Standard, Advanced, or Ultra. Additional layers of protection cost a small monthly fee—and the cost is well worth the extra peace of mind you and your household members enjoy online. Model pictured may be different than model received. What Are Modems and Routers, and Should You Rent or Own? Once your house is connected to CenturyLink Internet, a CenturyLink modem will ensure your household gets access. 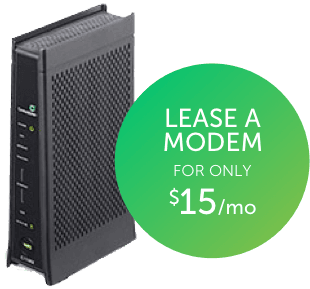 In some cases, you can purchase a CenturyLink modem right from CenturyLink, or you can lease a modem for a small monthly equipment fee. While you can use your own modem, you should double check that it’s compatible with CenturyLink internet before you buy the equipment. A CenturyLink wireless router broadcasts a strong Wi-Fi signal throughout your house. Some routers and modems come as one combined piece of equipment. Want to learn more about router, modem, and internet installation from CenturyLink? Give the customer service department a call!